On the eve of April 20 —a global rite of spring spawned by the mystic Waldos and their quest for the secret garden of cannabinoid splendor— the embrace of legalization has ever so subtly shifted our celebration toward an understanding of the purpose and effect of the endocannabinoid system. This system is the master regulator of human physiology. It turns out there is another system emerging from the primordial ooze, one embraced by half the planet while the rest cower in the grips of mycophobia. I'm referring to the realm of mushrooms. Some mycologists theorize that humans and fungi shared a common ancestry 600 million years ago and that we evolved from them. Besides a 20-minute Phish jam, where exactly do the mycelial and endocannabinoid systems connect? It turns out they do so in two supremely important areas: immune system function and neurogenesis. Viruses are well versed in the art of manipulating our immune system response to their benefit. As a result of an infection, cytokines, which are signaling molecules that promote inflammatory conditions, are stimulated to cascade in response to this intrusion. These cascades create out-of-control inflammatory situations that result in a viral takeover. The U.S. Department of Health and Human Services reports that Cordyceps, a genus of fungi, and cannabidiol (CBD) share similar abilities to down-regulate these cascades, thus promoting anti-inflammatory conditions that could hinder the progression of infections. Coupled with this anti-inflammatory response, cannabis and certain mushrooms possess immune-stimulating properties that can up-regulate certain immune responses, which can help the body adapt and react accordingly to threats. As for neurological health and well-being, the degradation of the neurological system is the hallmark of aging, overall health decline, traumatic injury, such as repeat concussions, and specific conditions like Alzheimer's and dementia. 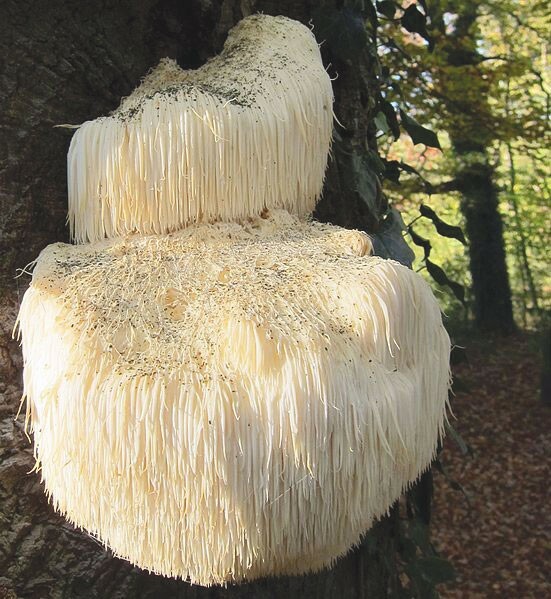 Research out of Malaysia shows that Hericium erinaceus, known as the Lion's Mane mushroom (pictured), possesses erinacines that stimulate nerve growth (neurogenesis) and help rebuild myelin, the sheath that insulates nerve fibers. Pairing with the antioxidant and neuro-protectant properties of CBD and THC could hold promise for mediating neurological damage after trauma and possibly serve as a preventative for neurodegenerative diseases. Patrick Anderson is lead educator with Project CBD. He will be celebrating 420/Earth Day/Bicycle Day at Emerald Pharms in Hopland from noon to 11pm.